$7 million buys backers a better way to whack bad guys. The Shenmue 3 Kickstarter reached its $7 million stretch goal, and you know what that means, right? You get a forklift! And you get a forklift! And-no, sorry, just kidding. 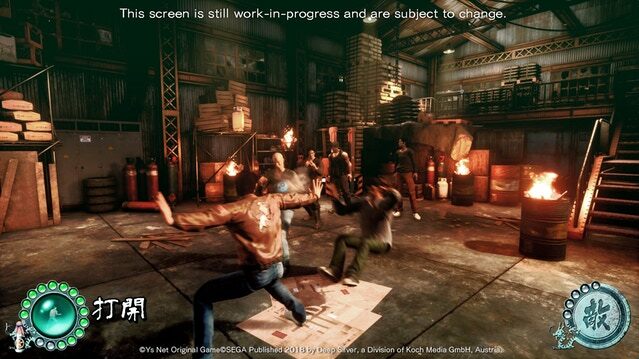 It means Shenmue 3's battle system is being expanded to include "AI Battling." According to an update posted earlier today, AI Battling is "highly compatible with, and will be an extension to the current battle system." It essentially lets you unleash the ideal technique according to your opponent's positioning and distance. The R&D for AI Battling is designed by project manager Yu Suzuki and is reportedly ideal for anyone who's not used to fighting games, or just wants a "full immersion battle experience." T-pose to assert your dominance. There are additional bits of news for backers as well. One update of note assures backers the Shenmue 3 team is working to ensure the physical PC and PlayStation 4 copies of the game have all data on-disc. "Please rest assured that the disc will not be just a prompt for an internet download," the update says. There is a caveat: An internet connection will be required "for the purposes of game updates and reward activation." Shenmue 3 is arriving sometime in 2019. The initial Kickstarter campaign is over, but there's still plenty of time to help the game meet additional stretch goals by being a "Slacker Backer." Tagged with News,	PC,	PlayStation 4,	Yu Suzuki. Don't you need a special license to drive those? Don't expect the PlayStation 5 until April, 2020 at the earliest. PS4 is still going strong. Kansas City's Patrick Mahomes is this year's Madden cover star. But, what about poor ol' North America?